Strategist Lawrence Freedman on the Ukraine crisis, and why making friends is often the best strategy. Exaggerates neither the dangers nor the ease of the current situation. Strategist Edward Luttwak is less sanguine. Hugh Howey on why every writer should self-publish. The greatest juggler alive leaves to run a concrete business. Visiting Andre Linde, who proposed the inflationary model, on the occasion of the observation of gravity waves, supporting his theory. And Ambassador to Her Serene Majesty of England. O most illustrious Knight, if I had driven a plow, herded sheep, cultivated a garden, or trimmed a garment, then no one would have held me in much regard, few would have seen me, and even fewer chosen to deal with me, and then I could well try to please everyone. But, because I have tried to describe the field of nature, consider the disposition of the soul, partake of the life of the mind, and travel like a master artificer through the maze of the intellect, those who have regarded me have threatened me, those who have seen me have assailed me, those who have encountered me have tried to bite me, and those who have understood me have tried to destroy me; not just one, nor a few, but many, or virtually all. If you want to understand why this is so, I will tell you the reason: everyday people displease me, commoners are odious, the multitude discontent me, and only the singular one is my beloved: through her I have freedom in subjection, happiness in sorrow, wealth in poverty, and life in death; through her I escape envy of those who are servants in freedom, have pain even in pleasure, are poor despite their wealth, dead though living; for in their body is that chain that binds them, in their spirit is the hell that oppresses them, within their soul is the sin that sickens them, within their mind is the sloth that kills them; for they lack the magnanimity that grants resolve, the endurance for success, the splendor of the illustrious, and the knowledge that enlivens. Thus, I do not avoid the arduous path for want of energy, nor spare my arm from this work for laziness, nor in cowardice shrink from the enemy who confronts me, nor, dazzled, turn my eyes from the splendor of the divine; I am aware that I have a bit of a reputation as a sophist, more interested in seeming to be clever than in truly being wise, more ambitious to establish a new and false sect than to support that which is old and true; a bird catcher, trying to capture splendor and glory; an unquiet spirit, trying to undermine the foundations of good discipline by using siege engines of perversity. Therefore, My Lord, let the saints disperse those who unjustly hate me, may I always do what is pleasing before my God, may I gain favor with the rulers of this world, may the stars grant me fertile land for my seed and abundant seed for my land, that I might harvest abundant fruit from my labors, that the spirits be awoken and the hearts be opened of all who suffer in darkness: for I certainly make no falsehood, if I err, it is by accident, and I do strive for love of victory itself (because empty success and hollow victory are enemies of God, vile and without honor, and such are not truly triumphs); rather, I suffer, torment and tire myself for love of true knowledge and true contemplation. All this shall I make manifest through demonstrative arguments, dependent on lively reasoning, supported by moderated senses, admitting no false particulars, rather arriving like true ambassadors of objective Nature, presenting themselves to the searcher, appearing to the observer, clear to those who would understand, plain to those who would comprehend. So here I present my contemplation of the infinite, the universe and the innumerable worlds. Literally: to do what Daedalus did. Tycho's new album, Awake, comes out tomorrow in the US. Have you ordered your copy yet? 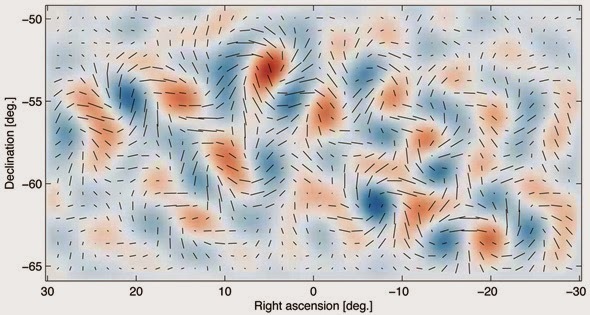 Scientists using data from the BICEP2 telescope array uncovered the signature of inflation in the immediate aftermath of the Big Bang (10 -25 seconds after the beginning of the universe) by looking at polarization of light caused by gravity waves. More here. BICEP data releases available here. William Ackman shorts Herbalife, then tries to make the short pay off by whatever means are at his disposal. Is there a tradeoff among equity, efficiency and freedom in economic systems? Paul Krugman says, not so much.